Halcyon Gallery is currently presenting its first exhibition devoted entirely to the works of Andy Warhol. 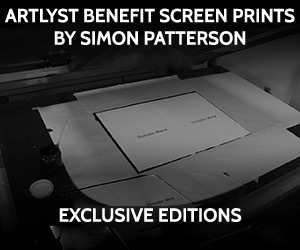 The show has over one hundred pieces on display, including graphics, portfolios and original works on paper and canvas. The exhibition explores Warhol’s works from the artist’s early illustrative works of the 1950s, through to Warhol’s Pop Art heyday in the 1960s, culminating with works from 1987 before the artist’s untimely death as “Bob Robert” and a gallbladder operation that would prove fatal. The exhibition is presented in a way that I’m sure the artist would have approved of; highlighting ‘Brand-Warhol’ in all of its glory. Shining forth from amongst the many portraits of iconic figures is a later portrait of the artist – ‘Self Portrait in Fright Wig’, a collage work on paper which exudes the very nature of the brand. Similar in nature to the artist’s ‘Self-portraits and Skulls’ – which always exudes that intentional impersonality – this is classic Warhol – as if the self-portrait is in fact a disguise. Here you get ‘surface’ Warhol, not the more fragile and darker one from the artist’s final works. Although the use of the same image juxtaposed with skulls, in the artist’s ‘Self-Portraits and Skulls’ espouses the bright Pop colours to reveal an obsession with death that was personal, with an eye that suggests Warhol himself, and not the work of one of his factory cohorts. The portrait on its own is a reminder of the darkness that lies just beneath that commercial ‘disguised’ surface. Image: Andy Warhol, Campbell’s Soup I installation view, Halcyon Gallery. Photo: P A Black © Artlyst 2016. Amongst the mastery of brand is the glowering ghost-like portraits of Joseph Beuys – haunting, enigmatic, and seemingly rather personal – the work feels like it has the personal touch of the artist, rather than the work of that factory mass production – this is the catholic Pop Art master’s true obsession with mortality floating to the surface, as Beuys stares out of the work; hollow and implacable. But we soon return to celebrity friends such as Ingrid Bergman and Muhammad Ali, reminding the viewer of the artist’s fascination and obsession with fame, and of Warhol’s commissioned portraits spanning the 1970s right up to the year before his death – with the artist’s wish for his ‘society portraits’ to all hang together in a huge display at New York’s Museum of Modern Art. Here we return to Warhol’s enduring aesthetic – the artist’s concerns with death are again suppressed by that of celebrity, as we leave behind Warhol’s obsessive electric chairs, or car crashes, and swiftly return to the artist’s fascination with the mass production of the image, repetition, and commercial cultural value. 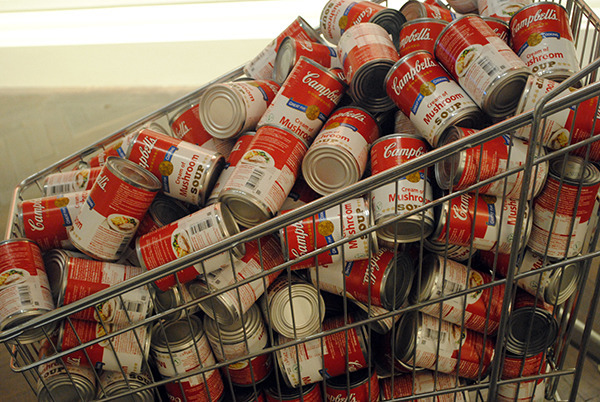 Image: Andy Warhol, Campbell’s Soup I installation view, detail, Halcyon Gallery. Photo: P A Black © Artlyst 2016. The largest installational display in the gallery follows Warhol’s original 1962 brief ‘to simulate cans stacked along supermarket shelves’, with the repetition of the instantly-recognisable packaging present in the Campbell’s Soup I portfolio: returning the viewer to the intentional lightness of being, mass production and explorations of the commercial image as culturally iconic. 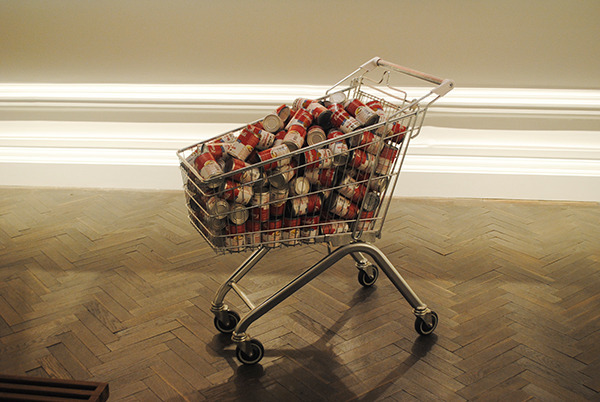 The installation, complete with shopping trolley and red walls, discards the white cube nature of the London gallery, creating a contemporary response to the artist that reminds the viewer of Warhol’s enduring relevance in our ‘all-consuming’ culture.